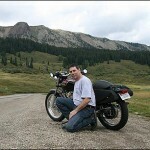 Jeff has lived in Baltimore and worked on motorcycles and cars most of his life. Sisson Street Automotive is a place were he takes pride in his work. He loves what he does and if not for his loving family he would spend everyday at his shop instead of just 6 days a week. When you visit Sisson Street Auto you see a piece of Jeff’s life in every nook and cranny. Jeff stays true to his motto: Old Fashion Service, Modern Technology and That Personal Touch.